Average rating: 4.3/5 from 16 comments. - Comment-on/Rate this shop. Serving Chicago's Portage Park neighborhood since 1937. Family owned and operated. Known as Lundin's Bike Shop when opened in 1937. Owned by current family since 1961. Head mechanic on staff since 1989. Brands Sold: Giant, Schwinn, GT, Haro, Trailmate, Sun, Dahon. Sells all styles of bikes including BMX, folding bikes, adult trikes, and tandems. Full line of accessories including car racks, computers, trainers, radios, bags, trailers, and tag-a-longs. Full line of fitness equipment. 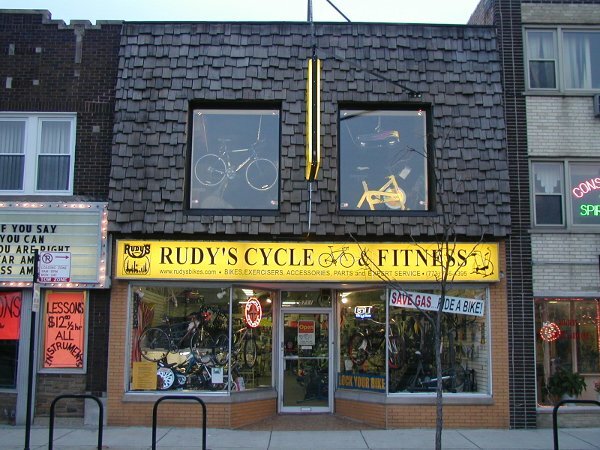 A great place to get oddball Schwinn specific tires. Offers 3-speed hub rebuilds. A sponsor of the MS bike ride, Eli's Fathers' Day Ride, Bike To Work Day. 2 years of free adjustment, complete tune up w/ new bikes.